I have long believed that if my weekly training is consistent over a period of time in the build up to a race, I have earnt the right for race day to go well. Since I usually include a reduced mileage week every 4-5 weeks, this doesn’t tend to result in me covering a huge distance over a calendar month. 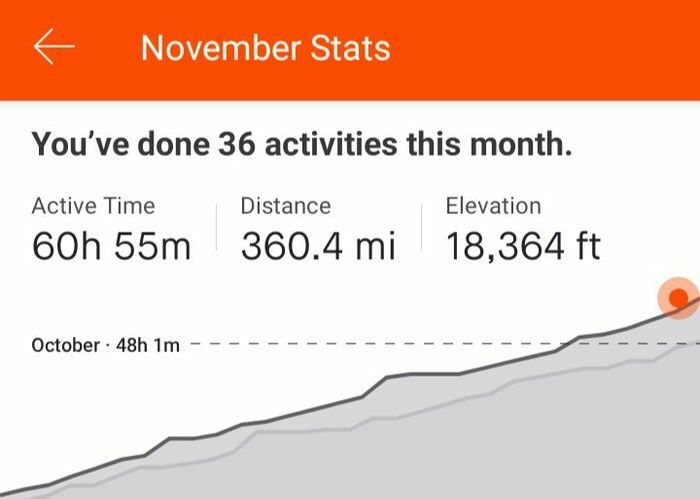 Prior to last month, my highest total was around 270 miles which was when training for the Last One Standing a few years ago. This was when my midweek runs wouldn’t exceed 10 miles and although my long training runs were broadly similar, I was definitely doing less 2-a-days than I am now. In November I had 7 days where I ran at least twice and only 4 days off. This evened out to significantly north of 270 miles! I started the week with a steady 5.4 miles on Monday then twice more on Tuesday. I did two laps of 7.5 miles on Wednesday and Thursday, then 3 laps on Friday. I had tried running with a new backpack and a waterproof jacket in the last of these which caused a horrific sweat/friction rash on my back. I was acutely aware of this from lap 1 but have plans for how to reduce the risk of this happening again. I finished the week with 15 miles today. My brother Ben was able to join me and it was nice starting the run at the same time rather than him joining me for the second half of a longer effort. We were also able to have short conversations for parts of this which made the time go faster. I spent a large part of this week reading a brilliantly surreal book called ‘I Crawl Through It’ by A. S. King. It was spectacularly immersive and I really enjoyed the structure of the book. Without spoiling the plot, it was cleverly put together and the character development was believable despite the surrealistic setting of most of the book. I particularly enjoyed this quote from near the end.